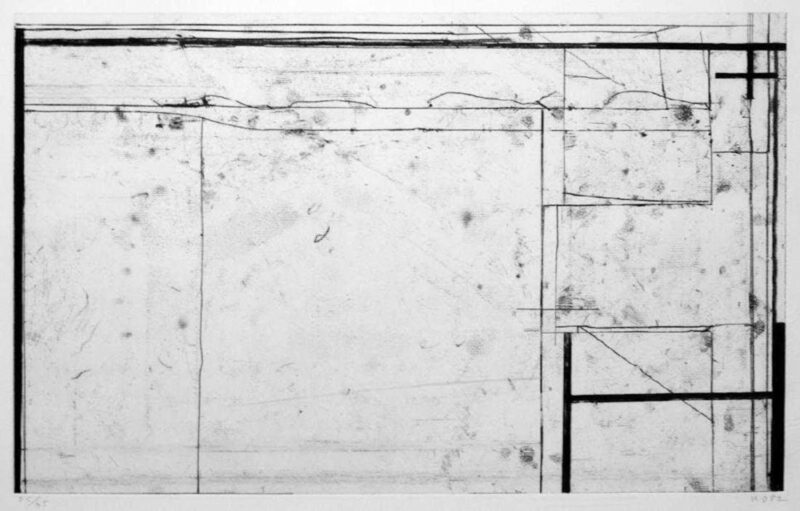 Richard Diebenkorn, Softground Cross is an original soft ground etching with drypoint printed in 1982. It is initialed, numbered, and dated in pencil, from the edition of 35. Published by Crown Point Press, printed by Lilah Tolland. A highly influential mid-century American artist, Richard Diebenkorn is known for his abstract landscape paintings, in particular the “Ocean Park” series, which he exhibited when representing America at the 1978 Venice Biennale. Diebenkorn’s work is often highly gestural and layered, his use of the medium comparable to that of contemporaries like the Abstract Expressionist Willem de Kooning, an artist he greatly admired. Diebenkorn, however, preferred California to the competitive New York art scene, and became a leading artist among the Bay Area Figurative painters. Even at its most abstract, Diebenkorn’s work remains rooted in the outside world, and he is celebrated for capturing his surroundings on canvas without representing them literally. Moving between New Mexico, Illinois, and, ultimately, California, his work progresses in tune with the changing architecture and landscape. Diebenkorn also painted portraits, expertly combining figurative and abstract styles in the same picture.